NO GUTS, NO GLORY: a review of "One Day"
How is it possible to make a film this terrible from such a wonderful book? The film adaptation of Author David Nicholls’ internationally best selling novel, which traces the 20-year relationship and romance of best friends Emma Morley and Dexter Mayhew was the epitome of a crushing disappointment. Unlike so many other films that just do not even attempt to give the creative heavy lifting an honest try, “One Day” certainly had more than enough talent in its corner, and I believe that all of the principals came prepared to work diligently. From the stars, Anne Hathaway and Jim Sturgess to Director Lone Scherfig, who previously helmed the wonderful “An Education” (2009) and even Nicholls himself, who adapted his novel for the screenplay, I was more than anxious to see this film. I hoped that it would be a supreme visual representation of the novel that was often hilarious, filled with gorgeously witty dialogue and underneath the banter and painful sexual tension laid a deeply perceptive and at times, wrenching story that truly understood the push-pull nature of friendships, unrequited love and the disappointment that comes when one’s life does not turn out as brilliantly as one had high hopes for. Well, unfortunately the stars for this film project were seriously not in alignment as like some periods in the lives of the film’s primary characters, the end result was not nearly as shining as it should have been. “One Day” the film is a flat, dreary, sluggish, passionless affair whose superficial sheen completely undercuts the story’s unabashedly romantic, wistful and crushing core. What a shame as this could have been a film love story for the ages. Anne Hathaway and Jim Sturgess star respectively as the frumpy, socially passionate, insecure Emma Morley and the wealthy cad Dexter Mayhew, who officially meet on July 15, 1988 upon their graduation from college. After spending one romantically awkward night together, the twosome find themselves early the next day at the moment where they will either carry onwards with their lives never seeing each other again or perhaps, there was a connection after all. This interpersonal curiosity begins Emma and Dexter’s emotionally turbulent journey, which the audience views as snapshot vignettes that occur on every July 15th over the course of 20 years. We experience Emma’s stagnated post-college existence in a tiny London apartment that smells of “onions and despair” and her dead end career as a waitress at a horrible Mexican restaurant while Dexter ascends into television fame as the smarmy host of a late night music/evening life broadcast. From here, we chart their lives through creative and professional breakthroughs and downward spiraling emotional and drug-induced heartache. We see Emma and Dexter’s respective relationships, she with the geeky, aspiring standup comedian Ian (Rafe Spall) and he with streams of women including the vapid television hostess Suki Meadows (Georgia King). All the while, Emma and Dexter continue circling each other, growing closer, falling in and out of each other’s lives, and somehow always remaining connected even when their connection has seemed to have disintegrated permanently. All of this is ripe material for an epic love story that is also intensely personal as the core of the story is designed for all of us to chart the trajectories and the inherent fragility of our own lives through the characters of Emma and Dexter. This is firmly achieved via a late story development, which I will not reveal here, that makes you re-evaluate everything that had occurred before and informs every moment afterwards. With the novel, every experience felt lived in, therefore making the book as a whole resonate fully with potential readers. We read the growing pains of Emma and Dexter while remembering, and continuing to live through, our own growing pains. Anyone who chooses to pick up a copy of the novel may come to realize that Emma and Dexter, while existing as vibrant literary characters, are also stand ins for all of us. Their experiences are our experiences. Their disappointments, joys, hopes and fears are our own. With the film version, I was stunned to see how shallow the proceedings turned out to be. It had all of the notes but it could not play the music. Scherfig’s visual palate was surprisingly drab (completely betraying the opportunity to show off London as an essential character), her terribly slow pacing was punishing and most of all, “One Day” was emotionally empty. Everything just sat upon the screen dryly and without any sense of internal urgency. When this film needed to be at its most aching, I felt absolutely nothing. The film seemed to have no understanding of what makes friendships work and what makes them so potentially devastating as well. It was unknowledgeable of the growing process, the restlessness of one’s 20s, the internal confusion and potential need for stability in one’s 30s. It didn’t understand the process of discovering one’s sense of self worth and the hurt that occurs when what you felt you needed the most is the very thing holding you back from your own evolution. It was unaware of what it means to love another person so fiercely that life itself is unable to make any sort of sense without the object of your affection. Was Scherfig afraid to delve so deeply into the material, which is just begging for a filmmaker to do just that? Whatever the reasoning, “One Day” suffers tremendously from being a film that has no guts!! There was nothing occurring beneath the surface value of watching two attractive leads for two hours and that was just shameful to me. Another major issue happens to be those two aforementioned attractive leads. Anne Hathaway and Jim Sturgess are very well cast, especially Hathaway, who utilizes a British accent effectively and whose piercing beauty was dialed down just enough for Emma’s frumpier post-college years. While they have each nailed down their character’s traits well enough, neither of them plunged deeply. They resemble Emma and Dexter but they don’t embody them. On the page, I fell completely in love with Emma Morley. This woman was a tremendously empathetic character filled with such refulgent brightness than when the story shifted away from her, you missed her presence. Emma was a person I think we would all be happy to know in real life as she was forthright, quick-witted, open-hearted (sometimes to a fault) and with an inner sadness that made her a character to root for and cheer on. Her happiness was as much ours as her disappointments. In the film version, that sense of empathy never occurred. I hated how Hathaway was seemingly on the verge of tears from one end of this film to the other. While that visual sadness does not conjure much internally, it also undercuts the fullness of Emma Morley’s’ character. Looking sad is not enough. Now, dear readers, you know how much that I adore Anne Hathaway. Furthermore, we all know that Hathaway has the talent to dig deeply. If you have seen her blistering work in Jonathan Demme’s excellent “Rachel Getting Married” (2008), you know fully well that she’s got the stuff to deliver the goods. And yet with “One Day,” everything felt so flat. It’s not a bad performance by any means. Just a depressingly uninvolving one. The same can be said for Sturgess, who seemed perfect for the role of Dexter Mayhew. He possesses the devious charm of a scoundrel and devilish good looks necessary for the part. But, he has a decidedly trickier role to play. Throughout the novel, I was terribly unsure if Dexter’s affection for Emma was true or whether he was just waiting to finally bed her and be done with her. Every time I wanted Emma to get herself as far away from Dexter as possible, Nicholls would inject more backstory, more psychological motivation, more situations that greatly informed this character and by the book’s final sections, the fullness of his love for Emma became powerfully clear. Again, in this film version, it seems as if Sturgess is acting by hairstyle as he also finds nothing below the surface to play. And I’m sorry, but just graying the hair at the edge of his temples is not enough to suggest the passage of time and the heartbreaking interior growth he has experienced. Worst of all and crucially, Hathaway and Sturgess do not have any chemistry with each other whatsoever. So, that tidbit kind of sinks the proceedings more than a little bit, wouldn’t you think? As the final credits began to scroll and Elvis Costello sang his heart out through the movie theater speaker system, I had to wonder and even possibly concede that perhaps my hugely negative reaction was simply due to the fact that the movie inside of my head did not match what I had seen upon the screen. Was I just expecting too much as I had loved the novel so profoundly? As I have always said, books are books and movies are movies and it is the filmmaker’s job to adapt the source material to best represent it through the visual medium ensuring the spirit of the original material remains intact. With that, I decided to inquire the opinion of a couple who happened to be exiting the theater just as I was. The couple informed me that they did not like the film either and felt disappointed that the film never seemed to truly capture what a 20-year friendship would be like. They also felt that the characters of Emma and Dexter lacked the necessary depth to care about either one of them. And no, neither of them had read the novel at all and even expressed that they were unaware that it has been a novel in the first place. As it stands, “One Day,” based upon one of my favorite novels in recent years, has become one of the worst films of this year. On the late afternoon of August 20, 2011, I ventured to Bongo Video to pay my final respects to Nancy Streckert and the establishment that meant so much to me for nearly 16 years. Storm clouds were in the air that day, with humid, breezy air and the threat of rain in the atmosphere. It seemed to be a fitting meteorological mood for such a melancholy day. Upon entering the store, I was so pleased to see my friend Gretta Wing Miller behind the counter. We exchanged pleasantries about the sadness of it all, which was indeed anchored by the painful sight of witnessing half of the store shrouded in darkness where movies, film iconography, a video game and even a foosball table once sat. All of the section signs had been taken down. All of the remaining inventory was for sale to the public and placed upon shelves here and there. Yes, it was really happening. Bongo Video would close its doors forever in a matter of hours. And yet…it was not an entirely depressing affair. Decorations were abound on the outside of the store. Cookies and pie were also available for hungry visitors. And on the television screen in the store, Director Betty Thomas’ subversive and very funny “The Brady Bunch Movie” (1995) played and one goofy line of dialogue followed by laughter from customers punctured the darkness of the mood considerably. At last, Nancy emerged from a bit of seclusion. I have no idea of what may have been going through her head as she was wrapping up 16 years of work, as well as taking telephone calls from faithful customers and friends wishing her well and offering their condolences. But, I greatly appreciate her taking the time to speak with me over the course of an hour for this interview. Beginning while seated upon her store’s couch and continuing throughout the store, finally ending up at the cashier counter, where she and I shared myriad conversations over the years, without further adieu, here’s Nancy Streckert! SAVAGE CINEMA: Hopefully this one isn’t going to be too taxing to begin with. What were the origins of Bongo Video? What made you and Carl decide to open a video store? SC: What were some of the most surprising things you experienced over the years at Bongo? NANCY: I was amazed years later how quickly renting TV shows became so popular. We didn’t, and still don’t, have cable so I just thought to myself, “TV?! It’s just TV! Why?” Over time, I realized that TV has real writers and TV is really the place to find really new, interesting and different things. So, I get it now. Also, I’m surprised with how much I like Asian action movies now too! SC: By owning a local business, did you ever see yourself as having an active role in the community? Did you ever think that besides renting movies, that you served some sort of additional communal purpose? NANCY: At the beginning? No. At first, I really just saw us as being like a library. Eventually, we saw that we were a place to get direct recommendations from the people and that was because people could walk to our store. People could come to us to get ice cream. People were going out to do something that they like. They’re not just going to get gas. SC: How did you ensure that Bongo Video remained a location and an activity that people would continue to enjoy? SC: Yes! I remember that being truly enormous. What was the hardest aspect of the transition from VHS to DVD? NANCY: (very long pause as wearily she rubs her hands upon her face) I don’t even want to talk about that right now. SC: I think that says it all. Onto happier memories. As you look back upon 16 years of Bongo, what are you most proud of? SC: Why ice cream? What was so special about that to you? NANCY: (looks at me incredulously) It’s ICE CREAM!!!! Scott!! Come on!!! People got to buy ice cream and watch a movie. What’s better than that? SC: What do you hope that people remember most about their experiences at Bongo? NANCY: The joy of picking out a movie and the time it took to actually think about making that choice. The joy of discovery. The joy of finding a movie to take home and kick back with. It’s kind of like when you went to a comic book store and you were just able to look around and around and then, you found it! I loved just watching people walk around and seeing that joy when they found something. SC: Who are your favorite filmmakers? NANCY: Hitchcock. John Sayles. Miyazaki. Peter Jackson. And yes…Billy Wilder. SC: Do you have a favorite movie? NANCY: No, I do not. SC: How about the worst film you have seen? NANCY: (long pause followed by a facial grimace) Please don’t re-open those wounds! SC: Last question. Both of your children literally grew up in this store. I watched your oldest as a toddler and she is now about to enter high school. I remember when your youngest was born! What do you hope they gained from this experience, if anything? NANCY: I hope they have learned that people are adaptable to change. I didn’t think that I could ever do this—close this store—but I can. After scrawling some more notes upon my yellow legal pad, and watching Nancy speak with more faithful visitors from over the years, I finally bid the store farewell. Nancy and I embraced, she with some visible tears she was anxious to wave away and me, oddly enough not able to find the proper words to thank her as I would have wanted. But, I hope that with this two-part tribute, she and Carl know how much their seemingly impulsive gesture to create a video store meant to me and so many others in the Madison community. I hope they know how appreciated and loved they truly were and how our city landscape grew that much closer because of them. Thank you Nancy and Carl. Thank you Bongo Video. My heart feels so heavy right now. I have never known the origin of the proverb, “All good things come to an end” yet with all due respect to whomever first uttered the quotation, I have to emphatically disagree when it comes to the closing of Bongo Video, a local business in Madison owned and operated by Nancy Streckert and Carl Denger for nearly 16 years. The sea change in the home video industry from VHS to DVD/Blu-Ray and now streaming to your telephones has taken its toll upon Bongo and on August 20th of this year, the doors closed forever. I guess it is an inevitable outcome but it is still a reality that is so painful to me. First of all, and I do realize that I may be more than a little naïve, but in my mind, I would think that the different formats of how customers could obtain movies for home viewing would be able to co-exist in some way. Whether truthful or not, we are all being told that this perception is incorrect and frankly, I hate being forced to follow along into the world of faceless, robotic businesses even further with mail delivery and so on. But, for me, and most importantly, my sadness stems from the fact that Bongo Video was so much more than a store. It was a place where my cinematic passions were rewarded, nurtured, sustained and throughout it all, I met many wonderful people, from the owners and staff to the customers, and I made a collection of great friends. In my mind, this is the reality of a small business, as we’ve been hearing this term politically tossed around in recent years. Bongo Video was a part of the Madison community that celebrated its commitment to its community. Bongo Video was the epitome of what small businesses do when they operate at their very best. I first became acquainted with Bongo Video in 1995, when I worked as a “Sales Agent” at a now defunct children’s educational toy/book store. While on a brief respite inside of our break room/storage area, a co-worker had mentioned the name of the place to a few staff members and I became intrigued. My video renting, at that stage of my life, essentially was exclusive to a Blockbuster Video that was located in fairly close proximity to the apartment I lived in and I have to admit to feeling a tad reluctant in trying a new establishment. Yet, somehow, this co-worker spoke of Bongo Video as an entity that exhibited a certain uniqueness in the home video renting market. Yes, the store happened to be located in close proximity to his abode but still, he made it sound like this place was refreshingly different. Bongo Video was originally housed in a seemingly perfect location. It was a funky little store nestled next to a popular Thai restaurant on the defiantly Earthy and very funky Williamson Street. Known to all as “Willy Street,” an area with its apartments, colorfully eccentric denizens, and stream of coffeehouses and all manner of off-the-beaten path restaurants, the new video store felt to be a most logical addition to the street which was also a traffic thoroughfare bridging the east side of Madison to the downtown area and beyond. While I do not remember the first time I walked into Bongo Video or what I even rented (that is, if I rented anything at all as I may have entered the store solely to investigate it), on first sight it was immediately obvious that Bongo Video was not the standard looking video rental store. I guess you could say the décor made me think of a clubhouse, the sort of clubhouse that anyone could potentially join if they so wished. Yes, there was all of the requisite information about obtaining membership and comparative rental prices but what I immediately enjoyed were the cinematic sights of film iconography reconfigured with playful and sarcastically ironic sayings and statements encouraging all who entered to try out a title, a section or anything else available to the public within the store. None of the staff members wore matching uniforms and all of them engaged in conversation after conversation with customers concerning the quality of one film over another, and passionately suggesting titles to try out for an evening. Over the following visits, during which I did begin to rent movies, I discovered that unlike other stores, which would hold titles for you for an hour if at all, Bongo Video would hold titles for you until that day’s closing time. I found this to be a healthy piece of knowledge to have when desiring to obtain the new releases quickly and beat the rush of competitive viewers. Each day of the week had a special rental promotion. One day of the week even carried a Trivia promotion where a customer could answer a Trivia question at the counter and if answered correctly, that person could obtain a free rental. Ice cream and other tasty treats were sold daily. The store was family friendly, children friendly and even canine friendly as one would often see dogs with their owners perusing the aisles hoping to retrieve one of the several dog treats that sat upon the check-out counter. While I still traveled to the closer Blockbuster, Bongo Video slowly became my exclusive place to rent movies as it seemed to call to me with its uniqueness coupled with a newfound desire to give my support to a local business. I figured that Blockbuster would be fine without my constant presence and Bongo possibly would need me more. By the time, Bongo Video opened a second store, literally around the corner from my apartment, my bond with the business became cemented. Unless there was a title the store simply did not carry due to its smaller size, there was absolutely no reason whatsoever for me to go anywhere else and my allegiance to Bongo Video became steadfast and ultimately, passionate. I cannot count the times when I casually arrived at the store with the sole intent to pick up a particular title or just to browse for a few minutes and before I knew it, I had spent hours in the store, conversing with staff members, at first about films and eventually about our lives and the world in which we lived. Over the years, I met the loquacious and deliberately paced storyteller Gretta Wing Miller, a passionate documentarian and film editor who has worked extensively on television documentaries (American Masters, National Geographic), briefly worked as an editor on Director Bob Fosse’s brutally masterful “All That Jazz” (1979) and currently owns and operates her own Madison based studio. Through Gretta, I met her daughter Robin, who worked as a Bongo Video clerk as a teenager, moved away after graduation, became a masseuse and just this summer, Gretta showed me Robin’s wedding photos. There was Elizabeth Blume, another teenage clerk as well as a beautiful blast of sunshine whose graciousness made me feel like a friend the instant we met. Through her, I met her wonderful parents, Sandy and Ed, as we lived in the same neighborhood. I watched her graduate from high school, go through her years as a preschool teacher, even working at the same school in which I toiled for a spell. Now that she has got be around 30, I am so happy to tell you that I still know her to this day and treasure her more than ever. I met the sardonic Jesse, the even more sardonic Jenny (who spent copious amounts of time howling with me at Showtime’s ridiculous series “The L Word”), the adorably sly and raven haired Kelsey McDade, the lovely Sarah Austin, a massage therapist and also the inimitable Peter Kaesberg, whom I first met at Madison's legendary (and currently struggling) B-Side record store years earlier. For many years, until his departure from Bongo and Madison itself, one of my closest friendships was with Matt Sheyka, who encyclopedic film knowledge and eloquent discussion held me enraptured endlessly. To those people, and others who have come and gone over the years and ingratiated themselves to me, I salute you, I honor and treasure you and I thank you for indulging me and my passions, always extending friendship in the process. And then, there’s Nancy and Carl. While I cannot remember exactly how I met Nancy, memory tells me that our friendship was a fast one. Quirky, lovely, funny, and with the hugeness of her open-hearted nature, Nancy welcomed me to Bongo Video graciously, treated me as a world class customer from the start and our friendship built from that point. Carl, whom I saw less frequently, was Nancy’s equal in quirkiness and generosity. Nancy and I had our healthy film debates as aspects of our particular cinematic tastes differed grandly and we also had many comical discussions about potential renting selections she termed as “laundry movies,” the type of movies that one did not have to pay strict attention to, the ones where you could just fold your laundry with. To that, I would always parry with the admission that if I’m paying to watch a movie, then I want to watch the movie. In return, Nancy would cheerfully continue with her pitches, enchanting me all the while with her peerless enthusiasm. As Nancy and Carl encouraged a conversation with their customers about movies through the usage of tiny review cards customers could utilize for their own personal reviews, Bongo Video allowed me with my very first outlet for written criticism. Believe it or not, dear readers, the review cards were so tiny that I was indeed forced to spit out a complete review in just a few short words (and in my own questionable handwriting at that). But I didn’t care about the hows and whys. I was so happy to be able to have this opportunity and Nancy tacked up every single card I wrote next to the films in question. In fact, on one occasion, Nancy asked me if I could actually refrain from writing negative reviews of new releases because what I was writing was actually being read and adhered to!! While I was stunned that anyone would pay attention to any of my scrawled out reviews, I happily relented in complete respect to Nancy and her ability to run her business as best as she was able. Areas of Bongo Video were devoted to Staff Picks in all manner of categories from selected titles of favorite filmmakers to the most arcane sub genres. Nancy and Carl once allowed me the opportunity to create an "Honorary Staff Pick" shelf and I relished the experience while also discovering how difficult it was to pick 20-30 random titles out of an entire store to spotlight. What I thought would be a twenty minute process ended up being about two hours and throughout it all, Nancy, Carl and their staff remained so open, so positive, so welcoming and I knew I would never have this experience anywhere else. But, it was not always just about the movies. With Nancy, she truly cared about the individuals who visited her store. I always heard her in deep conversations with customers about their lives, their families, the schools their children attended, the politics of the day and so on and eventually, I saw and understood how the process of relationship building contributed to the success of Bongo Video. During an unexpected renting lull a couple of years ago, Nancy even called me at home just to check on me as she worried that something awful had happened as she had not seen me in some time. After assuring her that all was well in my world, she gave me a free rental for no reason other than it was something nice to do. I don’t think that I could ever fully express how touched I felt by the gesture, the concern and the fact that Nancy knew her clientele so completely that she would take the time to inquire about me. And furthermore, if she performed this duty just for me, she undoubtedly had done the same for anyone else who faithfully frequented her store. After pouring through all of these written memories and emotions, I think what I am trying to express to you is this: At Bongo Video, movies were the catalyst for the continued nurturing and growth of a community. This is why the end of Bongo Video has been so painful for me. Yes, it is just a store. I know it’s a store but for me it was so much more than being a faceless brick and mortar location where items were rented and sold. Bongo Video was a social experience, a place where people enjoyed visiting. Going to Bongo Video to rent a movie was never a joyless task because once you arrived there, you were always among friends. Over the sixteen years I spent at Bongo Video, I watched Nancy and Carl’s children, now ages 7 and 14, literally grow up in that environment and in turn they have watched me grow up as well. I have written quite a bit about symbiotic relationships on Savage Cinema and life at Bongo Video is a prime example of how those symbiotic relationships work and thrive. Because of Nancy and Carl’s endless generosity and kindness, I wanted this business to succeed and succeed grandly. By the time, Nancy and Carl closed the store’s original Willy Street location and moved the second location into a nearby strip mall with considerably less neighborhood foot traffic, I guess I knew that the writing was on the wall. I didn’t want to even consider a world without this store and I was determined to see Bongo Video survive. I felt that if I were somehow able to rent every title all by myself, they would have enough funds to keep the operation afloat indefinitely. But, nothing lasts forever. Now I do realize that the end of this store is insignificant when you hold it in perspective to the real tragedies of the world. That said, it doesn’t make my sadness any less real or valid. Forced change is something that I have always found myself struggling to accept and for now, I just don’t like being forced to accept a world where we have to go further into technological isolation as the social experience of Bongo Video will be intensely missed. Very recently, one of my dearest friends from childhood suggested that perhaps I purchase the store myself and take it over. Believe me, dear readers, the thought did enter my head, especially as the news of Bongo Video’s closing first became public knowledge, therefore a blinding reality. In fact, the suggestion reminded me of the wonderful conclusion of Kevin Smith’s “Clerks II” (2006) in which our our slacker anti-heroes Dante and Randal confronted their 30’s malaise by deciding to purchase the Quick Stop convenience store and operate it themselves. Like the person who would want to wrap themselves around a tree to save it from being cut down forever, I feel the same. If I were able to save this store singlehandedly, I would do so in a heartbeat. If I had any business sense (in addition to the necessary funds to own and operate) I would easily take it over and continue what Nancy and Carl began to the very best of my abilities. But, I can’t. I wish I could but I just can’t and there’s nothing I can do to stop the inevitable no matter how badly I wish otherwise. "Times change," said Nancy, in a recent newspaper interview. "Stories come to an end." Very true. Very sad but very true. I know this tribute has got to be one of the lengthiest I have written and I appreciate any of you who have taken this ride with me. But, I feel that I owe Nancy and Carl a tribute of this nature just to thank them for what they gave to me since 1995. And yet, no matter what I write and how much I write, it could never fully express the gratitude I feel as no amount of words would ever be enough. Goodbye Bongo Video. There will never be anything like it ever again. And how sad it is that it had to end at all. But…how thankful I am that it was here for as long as it was. REMEMBERING JOHN HUGHES-TWO YEARS LATER: a review of "Don't You Forget About Me"
Special thanks given to Keith Carlson and Linda York Carlson for providing me with a film I would otherwise have never seen. It was a journey I had wished that I had taken. During my adolescence, as I was immersed and enraptured by each new film release from John Hughes, I became particularly obsessed with the idea of having the opportunity to meet him. If I were ever that fortunate, all I could hope for was to have a few minutes where I could simply thank him for the movies that had altered the course of my life and if he were to allow it, perhaps I could even ask him a few questions about his work and process. Due to my Chicago upbringing, I did possess a certain fantasy that since he was a Chicagoan as well (albeit from the Northern suburbs) that a meeting would just fall from the sky as an act of serendipity. It was a dream, to be sure. But still, that dream felt tangible. 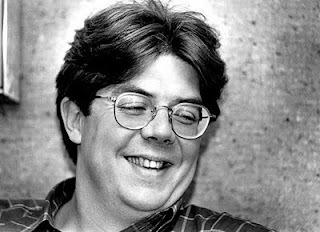 Somehow, John Hughes always seemed to be just this far out of reach for me. I did write a few fan letters, which I will never, ever know if he saw and of course, I never received any responses. Yet, I knew friends who wrote to him or some of his cast members and magically, they were enrolled in Hughes’ short lived fan club which graced members with all manner of Hughes paraphernalia and iconography from a newsletter, buttons, posters, music and so on. I never received such a package and I had to live through my friends’ enjoyment vicariously. This was especially so, as after John Hughes' death, a stunningly beautiful blog post written by Alison Byrne Fields hit the media as it described the pen pal relationship she had with Hughes over a two year period and an hour long phone conversation she had with him in 1997, long after he had vacated Hollywood. It was the very relationship I wished that I could have had, as I felt that no one championed him as much as I did. Such is the life of an unrequited fan. In the summer of 1988, when I was employed in the Ticket Master Call Center, I decided to cast out a few lines. Whenever I received a phone call from someone located in those Northern Illinois suburbs, like Winnetka, Glencoe or Lake Forest, and depending upon the tenor of the conversation, I would occasionally toss out something like, “Northbrook? That’s John Hughes territory isn’t it?” The responses I received from that simple statement varied widely from one person claiming that they knew Hughes’ Mother, to another that went to his high school at the same time but didn’t know him personally, to another gentleman who said, “I wish I had his money! !” Also that same summer, through some high school friends, I even met a young person who was immortalized in “Ferris Bueller’s Day Off” (1986) as the petulant extra who calls out Ferris’ sister Jeannie as a “heartless wench.” Every little tidbit felt as another stepping-stone but to what exactly, as I really was not getting closer to anything. This search for the man behind the films that raised the bar for the teen film genre and affected a generation of teenagers in the process sits at the heart of “Don’t You Forget About Me,” a lovingly affectionate documentary which serves as a tribute to the career of John Hughes. Additionally, the film is about a fiercely emotional pilgrimage of four young filmmakers from Toronto to Illinois, to potentially find this man if for no other reason to be able to say “Thank you.” How could I not relate to that? By 1991, the filmmaking career of John Hughes was effectively beginning to wind down. After the astronomical success of “Home Alone” (1990), the biggest box office hit of Hughes’ entire career, he directed only one more film, the saccharine yet heartfelt children’s fantasy “Curly Sue” (1991). He continued to write and produce his original screenplays, yet those original stories were soon overtaken by what Hughes once referred to as “the ‘Home Alone’ business” as all of the major studios wanted a piece of the action. Over time, Hughes’ box office successes became fewer and fewer, he would soon utilize the pseudonym of Edmund Dantes for screenwriting credits, interviews became seldom and suddenly, just as he once proclaimed he would do, John Hughes vanished from Hollywood in a puff. As Director Matt Austin Sadowski explains, the genesis for this film arrived when he and his Producing partners Lenny Panzer, Michael Facciolo and Kari Hollend had once conceived of the idea of creating a screenplay that would be in the tradition of a classic John Hughes film. Immediately discovering that they would be out of their league with that particular concept, the idea transformed into creating a documentary, which would examine Hughes’ artistic legacy and furthermore, possibly answer the question of why he abandoned Hollywood and would he possibly make a grand return. What impressed me the very most about this documentary was the access these four young filmmakers were able to receive in regards to their incredible interview subjects. Over the two and half year process of creating their film, “Don’t You Forget About Me” features interviews with Hughes alumni (Ally Sheedy, Judd Nelson, Andrew McCarthy, Mia Sara, Alan Ruck), Hughes’ closest collaborators (Casting Director Jackie Burch and filmmaker Howard Deutch), film critics Roger Ebert and Richard Roeper and even filmmakers greatly inspired by Hughes (Jason Reitman and Kevin Smith). Every single interview is akin to discovering a crucial piece to a larger puzzle and the culmination of those interviews and their anecdotes makes for a treasure trove. We are able to gather a peek into Hughes’ writing process and his skills as a creative collaborator with his actors. Hughes’ prolific speed and endless creativity is also recanted and one tale in particular was especially mind-blowing for me. Howard Deutch remarks, still with amazement in his eyes and voice, of the time he went to Hughes’ office to obtain some rewrites for “Some Kind Of Wonderful,” the film Deutch would soon be directing for Hughes. As Hughes wrote into the night, Deutch fell asleep upon the couch, awakening hours later to hear Hughes explain that he didn’t work on the rewrites at all but would Deutch please take a look at what he did work on. In addition to the shared stories about John Hughes and the surprise that his films have endured for over 20 years, Sadowski also takes ample time to explore why films of Hughes’ quality just are not being made today. Yes, Hollywood has changed profoundly over the years, not allowing for any artistic risks and making decision solely based upon the bottom line. The film questions if an individualistic talent like Hughes would even survive these days as there seems to be no place for truth and heart when it comes to just making money. Yet during the 1980s, John Hughes miraculously showed that you were able to do both as he wrote from his heart and teenagers came in droves. And aside from some good films here and there, including Director Will Gluck’s excellent “Easy A” from last year, where is that truth and heart now? I thoroughly enjoyed the footage in “Don’t You Forget About Me” that was devoted to interviewing modern day teenagers, so long removed from Hughes’ heyday, who have somehow connected deeply with his work and are stumped to discover any current equivalents. John Hughes respected his audience passionately and these days, that same love and respect is a shameful rarity. The contempt Hollywood has for teenagers is deplorable as the powers-that-be must think teenagers to be too stupid to realize what they have noticed immediately: everything is filtered through a plastic sheen of prefabricated cool with magazine model ready 20 year olds playing kids. It all rings false and no one is buying the fantasy. Beyond those moments are the great ones where Sadowski and his team arrive in Chicago, check out the sights immortalized on film in “Ferris Bueller’s Day Off” and then, their subsequent trek into the Northern Illinois suburbs. It is during this section where I felt my kinship with these filmmakers to be at its strongest as they make inquiries (much like I did during my Ticket Master days) amongst the townspeople as to their knowledge of Hughes and his whereabouts, as they hope that he will possibly grant them an interview for their documentary. The urgency I felt as I watched these four people discuss and debate exactly how they will approach John Hughes’ house was extremely palpable. What would they say should someone answer the door? Should they all go or just send the female in the group to the door? Should they draft a letter and provide Hughes with a cut of their film or not? Every question feels as if it could get them into Hughes’ inner sanctum or keep them forever locked out and that tension provides “Don’t You Forget About Me” with a weighty sense of hope, as their potential success would speak for all of us. So, did Sadowski and friends get to interview John Hughes? Well…I’d never spoil that for you, dear readers, as you would have to seek this film for yourselves to find out. “Don’t You Forget About Me” is a terrific post-script to the career of John Hughes and yet, if I had to offer even one criticism, I will preface it by stating it comes from a place of being a fan and not from a place of critiquing film quality. For a film that encompasses so much material, why does “Don’t You Forget About Me” run a scant 73 minutes?! Sadowski and his team obviously had more than enough material, including all of that incredible interview footage, so why didn’t they use more of it and at least stretch the film out to 90 or even 100 minutes? In many ways, “Don’t You Forget About Me” is over before it even starts and when it ended, I just wanted more as the experience didn’t feel complete enough for my tastes. Despite that criticism, “Don’t You Forget About Me” is surprisingly profound. As the film was being edited at the time of Hughes’ death, collected material obtains a certain poignancy. As Sadowski and his friends wonder if Hughes even knew of how celebrated he truly was, by fans all over the world, you can see how they are all just itching for the chance to show John Hughes the film they have made thus far. A film that would most certainly validate everything he ever did artistically as well as the fans for embracing his work so deeply. “You usually don’t get a tribute like this until you’re dead!” exclaims Kari Hollend. So sad and yet, so true especially as there has been a career re-evaluation of John Hughes’ work that was mostly analyzed dismissively at the time of the original releases. But Sadowski and his team know better as they present so handsomely with their documentary. Whenever people are touched that deeply by the artistry of one, all of those people cannot be wrong can they? I also hope that while he was with us, John Hughes knew how much his work was adored far ad wide. That he was appreciated, treasured, and valued. That his characters spoke for us so tenderly, perceptively and humorously. And we all know, now more than ever, that there will never be another filmmaker quite like him. At the outset of this review, I said that the journey within this film is one I wished that I had taken. But now, as I write, I am realizing that not only have I taken that journey, I think that I am still taking that journey. Savage Cinema certainly received a welcome workout last month and perhaps it is good that I foresee this month being a tad quieter as the amount of releases, or at least the ones I am interested in seeing, begin to slow down before the onslaught of the Fall season. 1. This will be a month of tributes as I have two entries of personal importance on the horizon. Firstly, August 6th of this month will mark the 2 year anniversary of the passing of Writer/Producer/Director John Hughes. To commemorate his work, I will again offer a special tribute to the man whose films profoundly altered my life with a review of the documentary "Don't You Forget About Me." 2. The second tribute of the month is equally personal yet physically closer to home as my local video store, Bongo Video, will close its doors forever, after 16 years of operation, in the latter part of this month. I have already begun to cobble something together and I am hoping to try and interview the store's owner. If I am able to gather such a conversation, my tribute to Bongo will be a two-part exclusive for the site and I hope that I am able to convey what this store has meant to me and the community in which I live and the sadness I feel seeing its end. 3. Aside from the tributes, I am hoping that "One Day" starring Anne Hathaway and Jim Sturgess reaches my local screens this month. 4. I am also looking forward to seeing "Terri," a teenage themed independent film starring John C. Reilly. 5. Beyond that, I think that I just may be able to squeeze in some surprise reviews and new entries into the "Savage Cinema Revisits" series. With my real world responsibilities heating up at the end of this month and sliding into the next month, I hope that I am able to again deliver to you the fruits of my cinematically inspired plans. Keep your fingers crossed for me and I would appreciate any well-wishes you are willing to send my way.